For the first time in more than 60 years, a law that allows detention of criminal suspects without trial will be changed to prescribe a list of offences under its ambit. These include unlicensed moneylending, drug trafficking, kidnapping and organised crime. The proposal is among several changes set out in a Bill, tabled in Parliament yesterday, that aims to spell out clearly the scope of the Criminal Law (Temporary Provisions) Act. This move by the Government is a response to a Court of Appeal's decision in 2015 to free alleged match-fixing kingpin Dan Tan, a Singaporean. The court said his detention under the Act was unlawful as his offence did not fall within its scope. The proposed list, non-existent currently, is given in a new section of the Bill, which also covers orders for police supervision of people suspected of the same criminal activities specified in the proposed list. Besides giving greater clarity to the scope of the Act, the Bill will "clarify the powers of the minister under the Act and strengthen the administration of the police supervision order regime", the Ministry of Home Affairs said in a statement yesterday. It will shift the obligations and restrictions on suspects under police supervision orders to a subsidiary legislation. The move will give the minister greater flexibility in imposing the necessary conditions and curbs. In clarifying the Home Minister's powers, the Bill said that for detention without trial, the minister's decision is final in two aspects: Whether a person is linked to criminal activities and whether detention is necessary for reasons of public safety, peace and good order. Once established, the minister has to get the Public Prosecutor's consent before issuing the detention order. 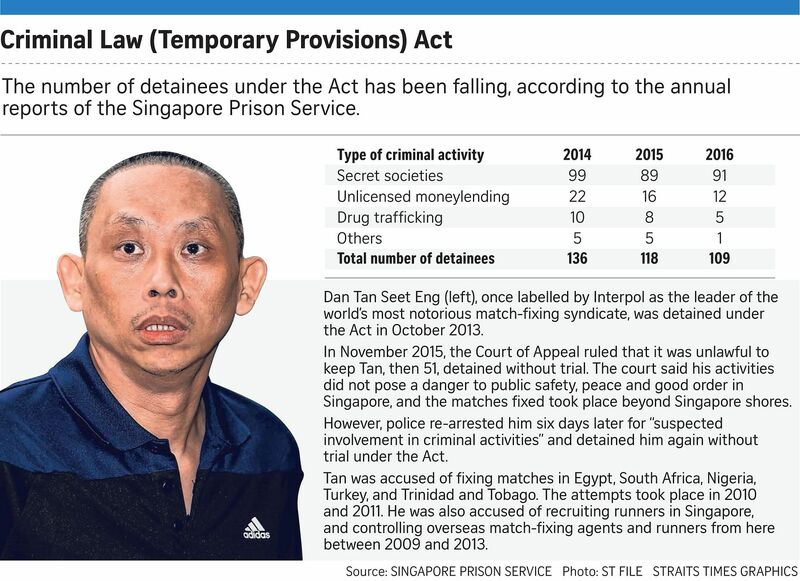 In 2015, when freeing Tan, the Court of Appeal said that while he may have run an international match-fixing syndicate from Singapore, his activities did not pose a threat to the public safety, peace and good order here. However, six days after he was released, the police re-arrested him for "suspected involvement in criminal activities", and detained him again under the same Act. The Act had been used against SMRT bus drivers as well in 2012 when they went on strike. Other facets of the Bill include empowering Central Narcotics Bureau officers to investigate breaches of police supervision orders as well as extending the lifespan of the Act for another five years, starting on Oct 21 next year. Introduced in 1955, the Act lapses after five years unless it is renewed, which explains why it is "temporary''. It has been extended 13 times. The number of suspects detained under the Act has been falling, according to the annual reports of the prison service. There were 136 in 2014, 118 in 2015 and 109 in 2016. The detention orders are reviewed annually. As a safeguard, every detention and police supervision order is reviewed by an independent advisory committee made up of prominent private citizens, including Justices of the Peace, former judges and senior lawyers. The committee will give its recommendations to the President who may confirm, vary or cancel the order on the advice of the Cabinet.